On 28 May, consultations on the EU Strategy for the Baltic Sea Region were held in Vilnius at the initiative of Lithuania and Sweden. Lithuania was represented by Undersecretary of the Foreign Ministry Žygimantas Pavilionis and Sweden by State Secretary for the European Union at the Office of the Prime Minister of Sweden Maria Asenius. Officials from the European Commission, Foreign Ministries of Denmark, Estonia, Latvia, Poland, Finland and Germany took part in the consultations. During the meeting, the most important projects that are envisaged in the Action Plan of the strategy, suggestions of the European Commission and the countries regarding the implementation of the strategy were discussed. These were the last consultations before the official launching of the strategy on 10 June. It is planned to start the implementation of the strategy during the Swedish EU Presidency in the second half of this year. The EU Strategy for the Baltic Sea Region is the first regional EU strategy, which aims at making the region prosperous, clean, safe, accessible and attractive for people. Key regional projects of energy, transport, environment protection, innovations, scientific research, public security, tourism and other spheres are highlighted in the Action Plan of the strategy. The strategy emphasizes the importance of cooperation with the neighbours in the East – Russia and Belarus, especially in implementing the projects of transport, environment protection and combating crime. The aim is to achieve that the strategy becomes a concrete and practical document. Therefore, terms of implementation of the projects are set out in it, as well as the countries and organisations responsible for the implementation and coordination of the projects. Lithuania strives to actively take part in coordinating the implementation of regional projects in the spheres of transport, energy, innovations and other. 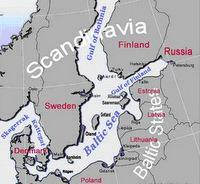 The strategy was initiated in 2007 by the European Commission, on the basis of the resolution of the European Parliament and with the aim to re-evaluate the cooperation in the Baltic Sea region, which after 2004 became an EU internal region, except for Russia. Adoption and implementation of this strategy is one of the key priorities of the Swedish EU Presidency, which begins on 1 June.